If you’re selling goods online, chances are high you’re doing it through Amazon. After all, the e-retailer was the world’s second biggest in 2017, with a 15% global market share. Considering that in 2018, around 2,8 billion customers shop online – a number expected to rise to 3,3 billion by 2023 – that’s a pretty big audience. To keep their millions of customers smiling from purchase to receipt, Amazon are now sharpening their focus on ‘frustration free packaging’ (FFP), a concept that was first introduced as early as 2008. The goal? To reduce waste and delight customers with easy-to-open, 100% recyclable packaging. But why worry about it now? Because Amazon are set to enforce FFP by October 1st, 2019. So, if your packaging is not up to standard yet, you have about 9 more months to prep. Any vendors not complying with the new Amazon packaging requirements for their ASINs (products carrying an Amazon Standard Identification Number) will be penalized with a 1.99 dollar chargeback per unit. A happy customer is a repeat customer. Finding ways to improve upon the customer experience is therefore one of the main concerns of any business. With a lot of time, effort and money invested in developing new products, advertising, shop design, … you name it. Sadly, even though e-commerce is booming, e-com packaging design is often just an afterthought. It shouldn’t be. After all: why even go through all the trouble of developing an outstanding product if the first thing your customer sees when receiving an online order is an uninspiring box? Even worse? An uninspiring box that is hard to open. Having to deal with excess packaging material (think void fill, hard plastic shells and zip ties, …) is off-putting and time-consuming. And it doesn’t end there. Even after the product is unpacked, your customer still has to deal with hard-to-recycle waste. FFP provides the opportunity to offer an exciting unboxing experience, reduce unwrapping time and simplify recycling. A beautiful example of how FFP massively improved the customer experience is Amazon’s collaboration with Hasbro. By designing FFP for their popular Baby Alive toy, they brought down unwrapping time from 3,5 minutes to just 14 seconds. If you’ve ever seen a kid unwrapping presents, you know that’s a major win. Still not convinced? This will: Amazon are so sure of the added value of FFP, that they’re offering a one-time early adopter credit of 1 dollar per unit, intended to assist in the transition costs associated with the initiative. Don’t you just love staying one step ahead of your competitors? Complying with Amazon Frustration Free Packaging requirements will help you rise to the top of the search results on their website. A little trick we like to call ‘Amazon-SEO’. How so? Because Amazon are convinced FFP will lead to more satisfied customers … and therefore more sales. And as they are committed to maximising sales conversions, Amazon will list FFP-certified vendors more prominently than the competition. But there’s more. If your packaging qualifies for FFP, Amazon will not allow any other unauthorized sellers to bid against that listing (without their approval under FFP). As a result, FFP can provide brands with a significant advantage over the Amazon-overbox and help protect them against unauthorized sellers. 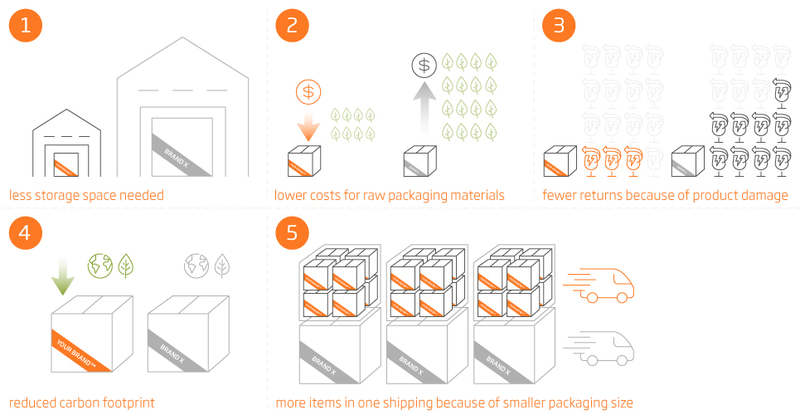 In 2017 alone, vendors offering Frustration Free Packaging helped Amazon reduce packaging waste by 16% and avoid 305 million shipping boxes. Are you shipping an item larger than 45 cm x 35 cm x 20 cm or exceeding 9 kg? Then you need to comply to Amazon's Frustration free packaging by October 1st, 2019. With the exception of products containing batteries (and other products under Amazon’s Hazmat qualification) and ASINs in Prime Pantry or Amazon Fresh. To qualify, ASINs need to complete the Amazon ISTA6 SIOC test method. Huh? No worries, they won’t leave you to your own devices. To help support vendors to obtain FFP-certification, Amazon works closely together with a number of companies and labs that are ISTA certified, like DS Smith.